I must be out of my mind, right? I was just cleared to run this past Monday and went for a sprint in a 3K race in Frankfort, Kentucky. No pain. No problems. And I did some outside running throughout the week to what my training schedule would have been had I been able to properly train for a marathon distance. Which…I haven’t. And…I didn’t. In fact, my longest run since the ankle sprain was done in Columbus, Ohio…around my friend’s neighborhood. And that was only 8 miles. Yep…not exactly going into this having logged double digit runs. AT ALL. Not since February…and I think the longest one I managed then was 10 miles. This…is not the way I wanted to come into this run. But, when you badly sprain your ankle…there are few choices left to you. Unable to run outside…and then limited to a treadmill (NOT a tready girl…I get so bored and long runs are not an option at a gym that limits you to only an hour on the machine). But…with the ankle rehabbed and my running slower…but okay…I packed up my bags, packed up my car, and made the long drive down to Atlanta. A full and hilly 26.2 miles. Because…I was cleared to do it as long as I don’t blitz it. I had no intentions of blitzing this one in the first place, so I was okay with that. But, that’s not to say the nerves haven’t set in. Because, trust me…they have. The drive down was pretty uneventful. Listened to some tunes…then a few Doc Savage radio shows…until I got downtown. Pulled into the Omni Hotel and had my car valet parked. The luggage was left with the doorman and I went to check in. I stayed at the Omni when I was in Atlanta for The Police concert so many years ago! So, I knew it was a very nice place to stay. And as I checked in, since I was here for the marathon, the hotel provided me with an awesome bag of goodies: a banana, a bottle of water, and a KIND Bar. This…is my happy face! Went to the room and waited for the luggage to arrive. When it did, it was time to head to the expo. Now, I had every intention of walking away from this expo with nothing more than maybe a new BondiBand…and my race packet. But then…EXPO AWE OF PURCHASING DOOM hit and my wallet…took the brunt of it. Now…for the most part, nothing was really something I didn’t need. I bought a couple of Wonder Woman tech shirts. YAY! Been looking for those everywhere. I bought a new pair of Newton’s…which was my splurge buy, but my old pair is up in the miles and, damn, I love those shoes. And…I bought the adhesive spray for my KT Taping. Oh…and while I was there, as an extra precaution, I had the people at the KT Tape booth tape up my ankle. Figured it wouldn’t hurt. After that…I had to get out of there before I talked myself into other items that caught my eye…because the shirts in the Official Merchandise store were tempting. But I really don’t need more shirts, LOL! So…Cathy and I left the expo and took items back up to the room at the hotel. We had some time to kill, so we decided to take a stroll over to Centennial Park. So…we did that and actually found the finish shoots and the start of the finish line being put up. We wandered over so I could take pictures in front of the finish line. Then, we strolled up to the Hard Rock Cafe so I could pick up a pin and Cathy could get a shot glass. Been ages since we’ve been to the Atlanta Hard Rock. We went to check out where we were dining that night before taking things back to the hotel, relaxing for a moment, and then making the short stroll up the street to dinner. Dinner was at Max’s Coal Oven Pizzaria. We saw them listed on Find Me Gluten Free with some good reviews…so we figured we’d give it a try. We were seated immediately and we made a decision on a gluten-free pizza to split. We chose the Gluten-Free Fontina & Funghi Pizza…which was a white pizza that had fontina cheese, wild mushrooms, caramelized onions, and fresh oregano. It looked amazing when it was delivered to my table…but it really…was kind of MEH. The mushrooms were awesome. The crust was…uninspired and rather boring. SO not the way I wanted my mandatory pre-race gluten-free pizza to go. So disappointed. After that, we walked over to the CNN Building to take a look around. We got some frozen yogurt for dessert and came back to the room to relax. I had my stretches and foam rolling to do and really just want some time to relax and make sure I was hydrated and ready for the morning. My first alarm went off at 3:30 a.m. I got up and did a couple of things before climbing back into my comfy bed and getting about 45 more minutes of rest. When my second alarm went off at 4:30 a.m., I checked the weather, then got up and got my clothes I laid out the night before and went to get changed. At first, I was afraid that the t-shirt under my Marathon Maniac’s singlet (OH…forget to mention I totally qualified for Marathon Maniacs back in January with the Disney Marathon) would be too warm. The temperature that morning was 58° F with little breeze. Wearing it turned out to be the best decision I have made. More on that later. I ate my cereal and then did my stretches (my physical therapists would be so proud!) and resistance band work (again…they would be proud). I brushed my teeth…then put on my fuel belt and bib and headed out the door. Then…I get to the elevators and realized that I left my cellphone in the room. So, I hurried back to the room to get it. Exit…take 2…I get in the elevator and head down to the lobby. I get to the door and realized that I left my pre-race banana in the room. So…now I’m stressing myself out and went back to the room and grabbed the banana…and my hoodie…just in case it was windy and chillier than the Weather Channel app on my phone told me. Exit…take 3. And this time…we made it out the door and onto the sidewalk. The start of the race was in Centennial Olympic Park right across from my hotel. No stress. So, I was starting to feel a little calmer and better about everything. I was supposed to meet up with the other Marathon Maniacs for a picture near a statue, so that was where we headed first. It was my first official photo as a Maniac…and that was awesome! The photo was a quick thing and then I went to find somewhere to do some more stretching and eat my banana. Cathy gave me a good luck hug and said she was off to find a place past the starting line to see me off. I decided to get into my corral (Corral E). Time was ticking down. Fifteen minutes to go to start time. The nerves were starting to settle in…again. The National Anthem was sang beautifully! I was listening to all the chatter in the corral about time expectations. I had none coming into this one. I just had a goal…to finish…and not get re-injured. Having just been cleared to run last week…well…this was a huge risk running this race. I had so many people tell me to defer. But…I figured if I was cleared to run…this was running. I would listen to my body. I got to chatting with a guy next to me. He noticed me getting my Garmin ready and he said his all-out died on him so he showed me his standard watch (with the actual watch hands and everything) and said he was taking it old school. Awesome! We got a good laugh about it and I mentioned I had to replace my Garmin because mine did the same thing. I love my new Garmin, BTW! Little treat to myself! The corrals began to get collapsed and the flag barriers removed. We all moved up and then the official countdown in a robotic voice began. And then…we were off. I walked for a moment, then we all started to job. And…we were off. I gave a wave to Cathy as I ran past her. She cheered and then…I was hitting the road. And this road was H-I-L-L-Y!!! Seriously…it became immediately apparent that I haven’t been able to train much this winter. First…I was barred from running for over a month. Then I was banned from running hills along with it…for longer than not running. That also meant no incline on the treadmill either. So…I was so not ready for the Hills From Hell™ in Atlanta. But…I signed on for this, right? Right. Between Mile 1 and 2, I had the chance to run with a really nice guy, also a Marathon Maniac. We discussed our sprained ankles, as he had badly sprained his ankle too and this was his first run back as well. His name was Anthony and he was really nice. I lost him at a water stop though. From there on out…it was all about what my body was telling me. With the number of hills and the various climbs and steepness of each…I said that if my ankle twinged, I would back it off. So…that was the plan. I wasn’t running for time…just the fact that I could run again! I absolutely took on this challenging marathon with my whole heart. I was having a really good run for the most part. They volunteers at the water/Powerade and food stops were awesome. I actually expected there to be more crowd support through the entire race…but…nope. It was pretty sparse. The Decatur area had some groups out and the police officers helping with traffic control were awesome. I got a lot of shout-outs for being a Maniac…which was awesome. It definitely helped me get through some of the more challenging portions of this race. Around Mile 16 it began to spit rain. I knew we had a big chance of rain…but it had held off. So…I was sort of expecting it (hence the reason I was wearing a hat). But…it only spit rain for about 30 minutes and then…it just stopped. Sadly though, when the rain came in…so did the wind. And some of these gusts of wind reached 20 mph. And we were running right into it. It kept catching the brim of my hat and trying to pull it off my head. It almost reminded me of the Marshall Marathon where the wind battered runners the entire way. Of course, with the wind…it got cold. Fast. And this is why I mentioned above why I was glad I decided to keep the t-shirt on. The beginning of the race was humid and warm and I sort of was kicking myself for putting the t-shirt on beneath the singlet…but after that wind hit…I was happy to have it. The end of this race was a gradual uphill, which made it very difficult at times. My calf muscles were screaming and barking and mooing at me all at once. Like I said…you could tell that I hadn’t been running the hills recently. Or…running at all. I felt way under-prepared…and a bit out of shape. But…you know…I walked part of the inclines…I kept my pace easy so as not to do any damage. And I ended up having a better race than I anticipated I would. Finishing a marathon in sub-4 after not being able to run for over a month, and having to tackle some intense hills…yeah…I’m happy with this! I spotted Cathy at the finish line and she rushed over to congratulate me. Then she said to go get my medal and stuff and to meet her in the reunion area. I walked through to get the beautiful medal from this race. Then…water. Ah, sweet water. And then it was the Mylar blanket followed by chocolate milk. 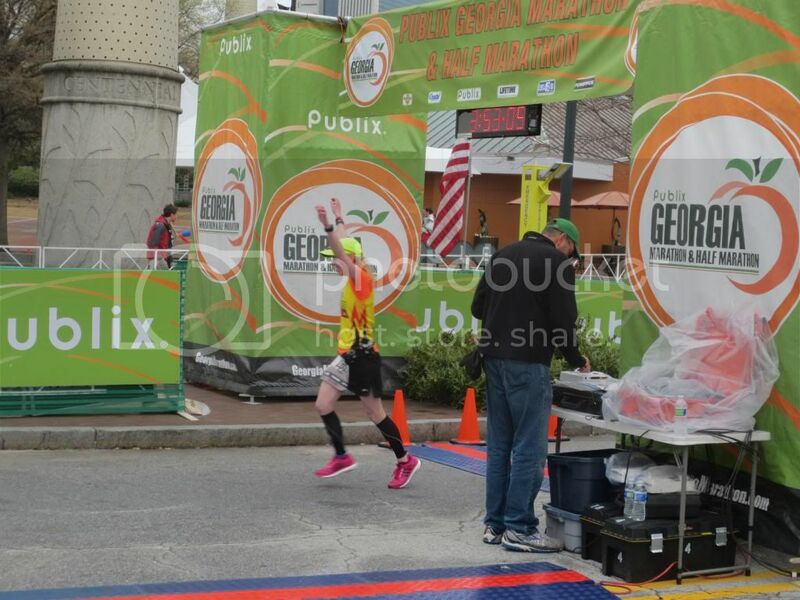 I made my way through the chute until I made the turn to head toward Centennial Park and the Publix Food Tent. Cathy was waiting on a grassy knoll just inside the gate. I walked over the area where the bomb went off during the 1996 Olympic Games and made my way to where she was. She gave me a huge hug and congratulated me once again. We made our way over to the Publix Food Tent and I had my ticket torn off my bib to get my bag of goodies for the finish. They even gave Cathy one. That was very nice of them…as Cathy works just as hard as I do at these races, trust me. I went to a clearing in the grass and put my feet up, attempting to call my parents. They were still in church though, so they didn’t answer their phones. After that, I got myself back on my feet and went to do my calf stretches against what we later realized was the base of the Olympic Torch holder. For real. It was really cold out with the wind, so we made the short hike back to the hotel room so that I could take my shower, have the fruit cup Cathy picked up for me and then get ready to head out to the CNN Center for the CNN Studio Tour she picked up tickets for while I was on the run. That, by the way, was so much fun. I have a degree in journalism, so I was eating up every moment of the tour. We did a little bit of shopping and TONS of walking around Atlanta. It was a good afternoon. And I never really stopped moving, which is always a good thing. And now, I’ve retired back to the hotel room where I am about to do my stretches and resistance band work. Law & Order SVU is on…and I’m feeling content. I was so nervous about this race going into it…and I’m content with what happened and how I did. Sure…slightly disappointed…but you know…this one had to be about running smart. It just had to be that way. 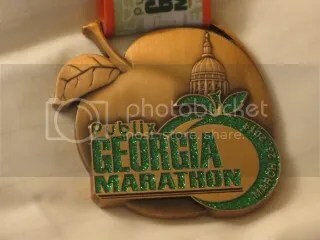 So…my official results of the Publix Georgia Marathon are that I finished in a time of 3:51:32 (for 26.47 miles). I wasn’t expecting to go sub-4 on this one, so this was a very nice surprise. I was 296/1628 finishers overall. I was the 64/647 female to cross the finish line. And I was 10/98 in my division. Was this the marathon I wanted? Absolutely not. But…it was the best marathon I could have given the circumstances I was under. I ran smart…I listened to my body…and I crossed that finish line. This entry was posted in gear, injury, life, mile markers, mileage, race, roadblocks, running, tales from the road, training by The Celiathlete. Bookmark the permalink. You know I’m sitting over here in awe. I don’t see how you do it….with no training what so ever. It goes to show that listening to and knowing our bodies trumps any work out/training plan. Congrats on another 26.2!!! And just to think it all started on an indoor track. You should be very proud of yourself!